Humanity has long been fascinated by the idea of what lies beneath, or just beyond, the limits of our perception. Anchored most firmly to the three dimensions of the physical world, and mired in the turgid everyday certainty of the banal and the ordinary, there has always been a sense that there must be something more to this life, something more dramatic, more meaningful. And so, in pursuit of this sixth sense that gods, good and bad, occupy the trees and the rocks and the sky, or that angels hover protectively over us or demons beset us, we have adopted religions, listened to conspiracy theorists, watched the sky for aliens swooping down to confirm to us that, if nothing else, we are worth invading, that we matter, that life isn’t simply the dreary bricks-and-mortar existence we know all too well. Intruders, the new series from BBC America, who gave us the similarly conspiratorially-inclined Orphan Black, makes it clear, almost from the get go, that we would be better off dropping this wonder-filled search for something otherworldly beyond the daily commute, that this way trouble, and much of it, lies. Or that if we must pay attention to it, that we do so with vigilance and care, of guardianship for our very souls, for in the shadowy world of Intruders, where mystery is commonplace, and answers to life’s big questions scarce, there are more threats than there are blessings, more fear than kindly spiritual concern. 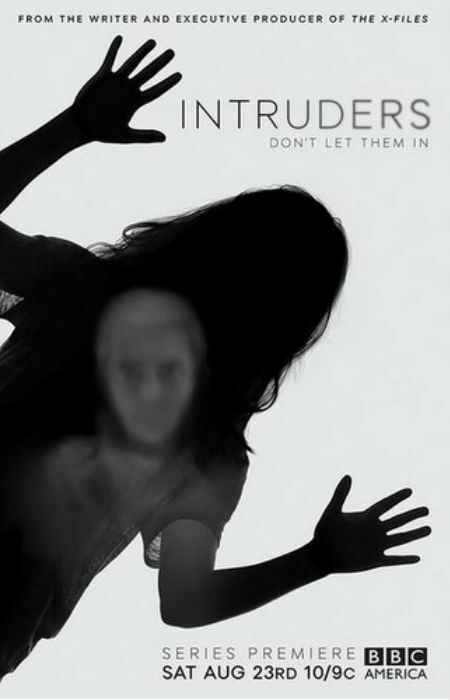 Based on The Intruders by Michael Marshall, a novel which mixed police procedural with supernatural conspiracies to devastatingly gripping effect, Intruders, in its own richly-atmospheric suggestion-over-substance way gives us a world in which the ordinary things of life mask secret societies, a battle for the souls of the living, a war between those who would seek eternal life at the expense of the living and the those few aware enough people willing to fight to stop them. 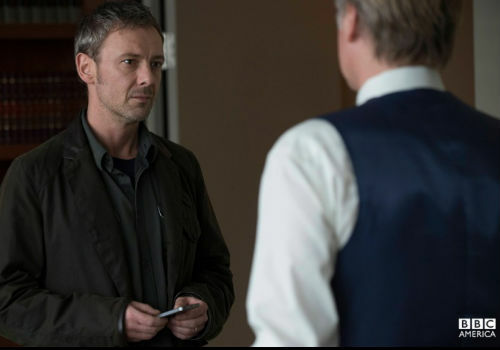 Jack Whelan (John Simm), retired LA cop now resident near Portland in the US Pacific Northwest is not one of those people, at least not initially. Happily ensconced in his idyllic seachange world with wife Amy (Mira Sorvino), he is done with looking under stones, the seedier side of life, content to enjoy the sweet, crime-free banalities of life. But when Amy starts to act out of character, listening to jazz, a genre she always professed to hate, becomes distracted and disengaged in their marriage where once she was loving and present, and then with no warning, outright disappears one day, Jack is confronted with a world beyond the one he knows which is far darker, insidious and secretive than anything he came across in the criminal underworld. 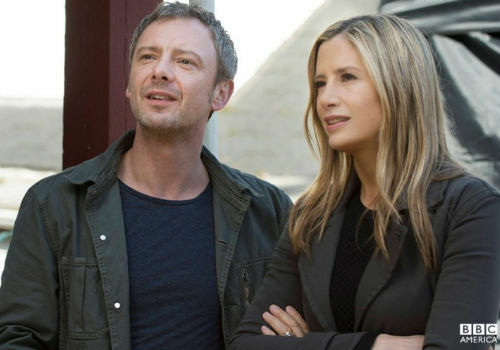 Intruders though is not the type of show to give up its secrets easily, even to a hardened, tenacious, intensely-focused ex-cop like Jack who slowly but surely realises there is more afoot than simply his wife going AWOL. Quite what is happening though is a mystery, even to those of privy to far more information that Jack, who bit by bit, and person by person begins to piece together where Amy has gone and why. Of course in the first two episodes of this tautly-written, of short on details, show, those pieces come together very slowly indeed. What we do see is more the sense of things that their actuality, the idea of evil, of something supernaturally malignant this way coming; details are short while impressions are many (which is not such a bad thing if you throw out some narratively explanatory breadcrumbs but these are few and far between to non-existent, resulting in a viewing experience which owes more to head-scratching befuddlement than “ah-ha” moments). What we are witness to is a little girl in the present day being approached on an isolated beach near her beachside home by a black-clad man (James Frain) who simply hands her a shell and a card with the number 9 on it, which precipitates a titanic battle between her soul and that of an intruder, a man who is hard, cold and patently dangerous. And we are handed a bewildering array of freaky television tropes – people with perpetually widened pupils and absent looks, a secret society complete with arcane rituals and riddle-filled literature, a dissident group of conspiracy theorists who are right on the money about the society’s evil intent, murder most foul (of both people and a cat), and symbols aplenty, all of which seem to revolve around the number 9 and birthdays. It’s clear that Intruders is pulling back the curtain between the banal and the supernatural but quite what it is is showing us isn’t quite clear even two episodes in. It is satisfying viewing in the sense that there is a pleasing sense of wonder and mystery to it all, confirmation that our suspicions that something more than bill paying and nights out fills this world of ours, but quite what it is, beyond the idea of two souls fighting for possession of one body and a vaguely-enunciated quest for immortality isn’t delineated all that well. The danger of course with this style of storytelling which glories in narrative sleight-of-hand and the impenetrable mist of otherworldliness is that you are left feeling like you’re grasping at the fog, with little of any substance to hold onto. That it is compelling viewing isn’t in dispute; it was almost impossible to look away from the hushed tones, the grey day time visuals and the night time skullduggery, the hints of darkness below the veneer of the everyday, fearful you might miss a vital clue, a telltale sign that will explain, even in a small way, what is going here. But too much of this, too few answers, too little understanding of what is going on and you run the risk that emotional investment is well nigh impossible, that whatever beguiling effect the look and feel of the show might have on you, will quickly be supplanted, in the absence of concrete answers, by an evaporation of caring, of the compulsion to see what happens next. It’s not necessarily a damning criticism since it is refreshing to come across a self-assured,confident in its storytelling style show, happy to take its time unveiling its secrets; but you can only hope that it doesn’t follow the lead of the reluctant to divulge, suitably creepy secret society at its heart, and leave the telling of these secrets too late for it to actually matter.